Glickenhaus Plans Race-Ready P4/5 Competizione For 2010! James Glickenhaus, owner of the wild coach-built Ferrari Enzo-based Ferrari P4/5 has told the Ferrari faithful he's finally set to launch a North American Racing Team-like race-ready Ferrari P4/5 Competizione. According to Glickenhaus in comments on the FerrariChat message board, the idea is to have it possibly race ready for 2010. Specifics, such as chassis/engine/gearbox, are "figured out" and will be announced soon. Although the above image, a rendering by Michiel Van Den Brink, based on the original, shows us what it may look like, Glickenhaus says it represents a "very rough" idea of what it'll look like when completed although "We're still working out the details and should have an image and specifications in a few weeks"
We're also waiting to hear what racing series it may be a part of, although in the spirit of the original N.A.R.T. they'll be looking at endurance racing and plan on hitting the 24 Hours Of Nürburgring. "We're looking for one major sponsor. That race gets 250k spectators and a lot of TV. In addition we could do other races and when her racing days are over we'd keep her in that livery and she'd go to a lot of events. There'd be a lot exposure and it's not going to cost Crazy money," said Glickenhaus. It'll be interesting to see where Glickenhaus goes with this considering "Ferrari P 4/5 Competizione will not be sold." That'll limit the sponsorship opportunities. 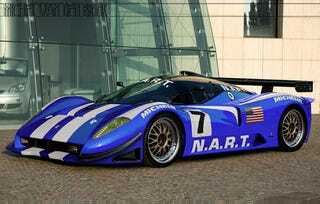 However, Glickenhaus claims he's willing to go it his own if necessary. Glickenhaus also announced he won't be racing the vehicle stating "my driving in anger days are behind me. We have some interesting ideas for drivers." All we know is we're excited as hell to see what he's got in mind and can't wait to see the first renderings when Glickenhaus releases them.